Teachers on summer break, it’s your time to join us as we head back to America’s last untamed frontier! 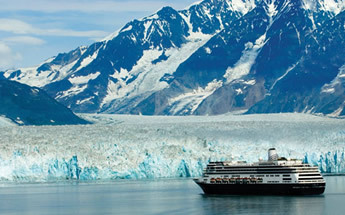 A guest favorite, this ultimate Alaska cruise is round-trip out of Seattle, and sails up the Pacific Coast to Ketchikan, Tracy Arm, Juneau, Skagway, and Victoria, B.C. Take advantage of the long summer days and watch as bald eagles soar through the skies, whales and sea lions take breathe next to boats and kayaks, brown bears cross trailheads in the Tongass National Forest, and miles-long glaciers calve before your eyes. Breathtaking natural beauty and 1,400 lesbians? Definitely the way the world was meant to be. If you love nature, this all-lesbian summer cruise is for you! You'll see abundant wildlife, magnificent glaciers, breathtaking mountains and forests, and quaint and charming seaside towns, all in the company of 1,400 women of Olivia! Olivia's magical energy tends to bring out much of the wildlife. 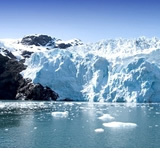 Watch in wonder as whales, puffins, and tidewater glaciers come into view. Go fly-fishing in pristine wilderness in Juneau, flightsee over Misty Fjords National Monument in Ketchikan, and enjoy a spot of English tea in Victoria, British Columbia. With brown bear sightings a real possibility, and bald eagles flying over the ship, you will truly experience nature's last untamed frontier with your new Olivia friends. Want to learn a little history? Skagway's narrow-gauge railway and old saloons boasts the gold-rush days of yore, and the "Ska-Gay" Town tour has been customized especially for the ladies of Olivia. In Glacier Bay, a UNESCO World Heritage Site, you'll revel in some of the highest mountain peaks and greenest rainforests in North America. You'll capture snapshots of bald eagles soaring, whales gliding, and brown and black bears puttering across the landscape. Eat your way through Ketchikan – the Salmon Capital of the World. Learn to salmon fish or go on a king crab feast. 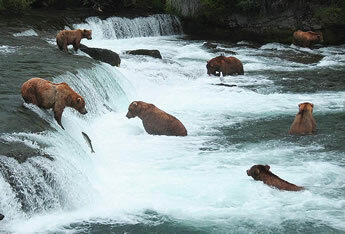 Or, for the adventurer in you, take a floatplane to scout out Alaskan bears! On your days at sea, rest and relax or listen to a lecture and ask questions of local experts who will be on board to share their knowledge of Alaska's culture, food, and wildlife. Did we forget anything? Oh yes, just that you will experience this journey with 1,400 women just like you. 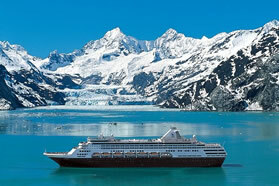 From the moment you step on board the ms Amsterdam you will recognize the Holland America Line difference. Each cruise sails with nearly one crew member for every two guests, providing the gracious, award-winning service that defines classic cruising. Holland America's cruise ships feature spacious wraparound teak decks, panoramic views, abundant spacious private verandahs and large staterooms. 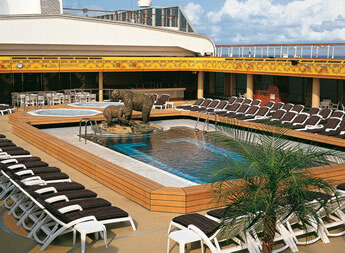 The Amsterdam features Signature of Excellence enhancements to staterooms and public rooms. 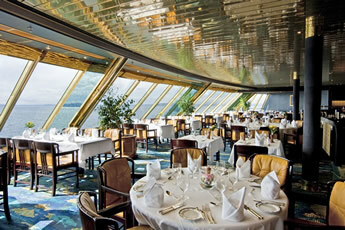 With elegant fine dining and a casual environment, you will discover timeless cruising, refined for a new generation. 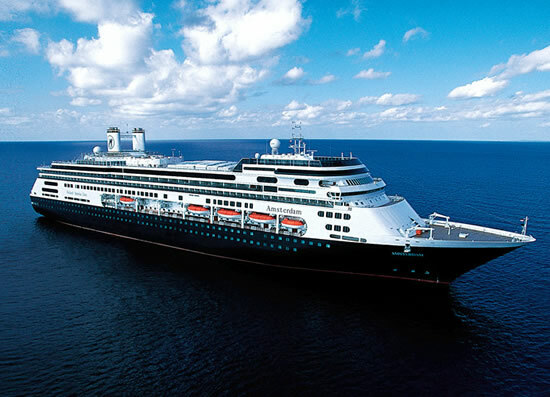 Named for the Dutch capital, ms Amsterdam is the third ship to bear the name in Holland America Line's over 140-year history. Built at the Fincantieri shipyard in Marghera, Italy, Amsterdam blends the very latest in shipbuilding technology with the artistry, personalized touches and superior service that has made Holland America Line one of the highest-rated cruise lines in the world. At the heart of Amsterdam is the Planeto Astrolabium, a commissioned signature sculpture soaring in a three-story atrium. The stunning Astrolabe tracks constellations, the planets, world time and ship time. Dutch heritage and tradition is clearly displayed throughout the ship in original Art Deco pieces that once graced the elegant Nieuw Amsterdam of 1938. For a contemporary touch, works of the noted maritime artist Stephen Card adorn public spaces. Guests on Amsterdam will be able to "show and tell" their vacation memories through the Digital Workshop powered by Windows®. Free workshops led by Microsoft-trained "techsperts" will show even the most novice camera or computer user how to take better vacation photos, make movies, edit pictures and create scrapbooks using a variety of Microsoft Windows and Windows Live services. Guests will learn how to share all their digital memories through email, blogging and social networking — so friends and family can see where they've been cruising even before they return home. 02 July Day at Sea! 06 July A Day at Sea! Harvester of trees. Provisioner to gold rushers. Gateway for sea commerce. Incubator of jazz and grunge, jets and literature, coffee and computer software. Seattle is as much about reinvention as it is a landscape. But what a landscape! There are lakes and mountains and forests everywhere you look. The rest is an archipelago of neighborhoods studded with boutiques and coffee shops. Catch a salmon at Pike Place Market, ride to the top of the Space Needle, sample a local microbrew in Fremont, or slurp a bowl of steaming pho down in the International District. Take in the views of Alaska with some friends and drink a glass of wine. Or join in one of the dozens of activities the Olivia team has planned just for you! Take a dance lesson, play bingo, head to the casino, or treat yourself to a spa day...the choices are nearly endless! Ketchikan clutches the shores of the Tongass Narrows, with many shops and houses built right out over the water. The stairways are weathered and the vibe is cheerful in the town that calls itself the Salmon Capital of the World. Besides the main attractions – Creek Street, the Tongass Historical Museum, Totem Bight State Park and Saxman Village – try a flightseeing trip to Misty Fjords National Monument. These deep-water fjords were gouged out by retreating glaciers, leaving granite cliffs towering thousands of feet above the sea and countless waterfalls plunging into placid waters. No roads lead to Juneau, which gives the Alaskan capital a misty inscrutability. You need to come by air or water, but when you arrive, the place will delight you with its bounty of water, forests, and mountains. Squeezed between the Gastineau Channel and Coast Mountains, Juneau offers a lot of variety in close proximity. The massive Mendenhall Glacier and the immense Juneau Icefields are at its back door. The vast Tongass National Forest stretches away to the northeast. You can shop downtown or get out and kayak, dogsled, raft, hike, whale watch, flightsee or fish. The adventures are as bountiful as the daylight, and this port offers some of the best whale watching along the Pacific Coast. 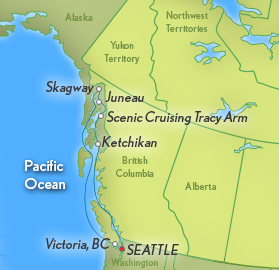 We will enjoy scenic cruising and Sawyer's Glacier as we cruise through Tracy Arm, where steep cliffs and glacier-covered mountains flank this fjord, fringed by the largest intact coastal temperate rain forest in the United States. Old-growth trees colonized Tracy Arm’s mouth long ago as the Ice Age retreated. But further up the sinuous 48-kilometer (30-mile) waterway, its icy grip lingers a little. Even more glorious than nearby Glacier Bay, Tracy Arm is part of the 5.7 million acres (or around 23,000 square kilometers) of pure wilderness sheltered by the Tongass National Forest (America’s biggest). Visitors often see bears, whales and mountain goats roaming across various corners of this pristine area—not to mention chubby baby seals resting on the ice floes. At the height of the Klondike Gold Rush, the port town of Skagway served as the primary gateway to the legendary gold fields, and quickly grew into Alaska’s largest settlement. Today it has been reinvigorated as a gateway for those looking to explore Alaska’s colorful history, pristine wildlife and unrivaled natural beauty. At every turn, you’ll find yourself immersed in gold rush lore, from the infamous Red Onion Saloon to the White Pass & Yukon Route Railroad (a spectacular optional excursion). Here you’ll also find a vibrant local community, home to a rich collection of local galleries, curious shops, and restaurants serving seafood plucked fresh from nearby waters. It is in Skagway that you can take a helicopter and land on top of a glacier, or combine helicopter flightseeing with the experience of dog sledding (optional excursions)! Hello, England. Fancy meeting you here! Victoria is a city that started as Salish Village, spent a roustabout adolescence as a main port for gold prospectors and opium traders, and then transformed itself into an icon of British gentility after the completion of the transCanada railroad put neighboring Vancouver in the ascendant. Two events were seminal: the opening of Butchart Gardens in 1904 and the completion of the Empress Hotel in 1908. Butchart is a collection of gardens more than a single garden -- highlights for cruise visitors include the Sunken Garden (built from a former limestone quarry), the Italian Garden, the Japanese Garden, and the Rose Garden (breathe deeply). The Empress Hotel is merely a national icon. 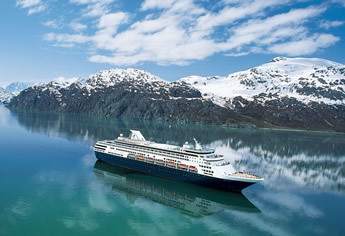 Today, you’ll disembark in Seattle and either head home or onto our post-vacation stretcher at Denali National Park. Navigation Deck. 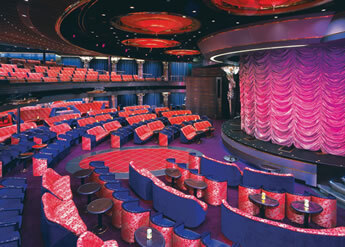 The Pinnacle Suite is the largest most luxurious accommodation on the ship. With approximately 1,200 square feet, including verandah, this Suite features a bedroom with one king-size bed, living room, dining room, dressing room, pantry, refrigerator, guest toilet, one sofa bed that accommodates two additional guests, oversize whirlpool bath/shower, floor to ceiling windows and private verandah. Navigation Deck. The Neptune Suites offer the most spacious accommodations next to the Pinnacle Suite. Indulge, unwind and relax in the comfort of this expansive suite. These suites feature two beds convertible to one king-size bed, one sofa bed that accommodates two additional guests, whirlpool bath/shower, large sitting area, dressing room, floor to ceiling windows and private verandah. Enjoy the same amenities of the Pinnacle Suite, including exclusive access to the Neptune Lounge. Approx. 568 square feet, including verandah. Verandah Deck.These staterooms feature two beds convertible to one queen-size bed, bathtub/shower, sitting area, floor-to-ceiling windows, a private verandah and all standard amenities. Pamper yourself with a verandah where you can enjoy spectacular ocean views while indulging in room service in the comfort of your stateroom. Approx. 295 - 377 square feet including verandah. Verandah Deck. These staterooms feature two beds convertible to one queen-size bed, bathtub/shower, sitting area, floor-to-ceiling windows, a private verandah and all standard amenities. Pamper yourself with a verandah where you can enjoy spectacular ocean views while indulging in room service in the comfort of your stateroom. Approx. 295 - 377 square feet including verandah. Lower Promenade. These rooms feature two beds convertible to one queen-size bed, bathtub/shower, sitting area, sliding glass doors with direct access to the Lower Promenade Deck, and all standard amenities. 181 – 256 sq. ft.
Main, Dolphin, Lower Promenade, Verandah Deck. These rooms offer an ocean view with a window for natural sunlight. Rooms include two beds convertible to one queen-size bed with bathtub/shower and all standard amenities. Approx. 140 - 319 square feet. Book now to get $600 pp off Early Bird! Dolphin, Main, Lower Promenade, Navigation Deck. These rooms have either a partial or obstructed window view. Rooms include two beds convertible to one queen-size bed with bathtub/shower and all standard amenities. Approx. 180 square feet. Lower Promenade Deck. These rooms have either a partial or obstructed window view. Rooms include two beds convertible to one queen-size bed with bathtub/shower and all standard amenities. Approx. 180 square feet. Lower Promenade, Verandah Deck. Interior staterooms offer a comfortable sleeping environment and include two beds convertible to one queen-size bed with shower and all standard amenities. Approx. 182 – 293 square feet. Dolphin, Main Deck. Interior staterooms offer a comfortable sleeping environment and include two beds convertible to one queen-size bed with shower and all standard amenities. Approx. 182 – 293 square feet. Main, Navigation, Verandah Deck. Interior staterooms offer a comfortable sleeping environment and include two beds convertible to one queen-size bed with shower and all standard amenities. Approx. 182 – 293 square feet. Lower Promenade, Main Deck. Interior staterooms offer a comfortable sleeping environment and include two beds convertible to one queen-size bed with shower and all standard amenities. Approx. 182 – 293 square feet. Dolphin Deck. Interior staterooms offer a comfortable sleeping environment and include two beds convertible to one queen-size bed with shower and all standard amenities. Approx. 182 – 293 square feet. 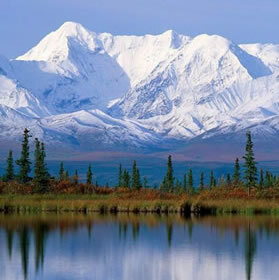 Denali Alaska All-Lesbian Adventure Tour. **Rooms include additional twin beds and can accommodate 3rd/4th occupancy. 3rd & 4th is $999 pp.